Dental care is an extremely important and frequently overlooked aspect in the health and longevity of your pet. Bad breath, known as halitosis, is caused by periodontal disease, and is easy to prevent and treat. Other causes of halitosis exist, but they are short term. A thorough oral exam is the best way to identify the cause and help you to formulate a treatment plan. The American Veterinary Dental Society reports that varying degrees of dental disease are present in all pets by their 3rd birthday. Dental disease begins as plaque - a buildup of bacteria on the teeth and gums. Plaque is soft and frequently difficult to see. Animals that have mild buildup of plaque often respond to in-home dental hygiene techniques the best. Eventually, the plaque becomes mineralized and turns into tartar or calculus. The calculus deposits are impossible to rub or brush off the teeth. By the time that the calculus has appeared, there can be damage to the gums and tooth roots. Many times this damage cannot be reversed, and teeth may have to be extracted. Other health risks can occur due to dental disease, as the bacteria in the mouth can travel throughout the body and infect organs like the liver, kidneys, bladder, and heart. Once these organs become infected, it can be difficult to detect until major, irreversible damage occurs. 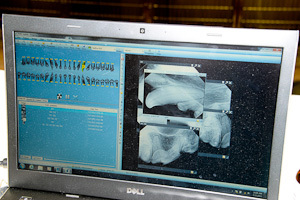 We perform full mouth radiographs on every patient receiving a dental cleaning! It is impossible to do a complete dental exam in an awake patient. A general assessment of your pet's teeth can't be made during a routine exam. There is much more information gained while doing a complete oral exam under anesthesia. 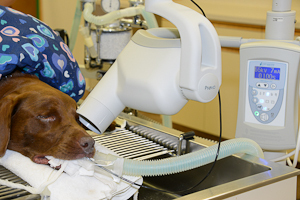 This information, along with our new digital dental radiographs, may lead to the necessary extraction of teeth in order to properly maintain the oral health of your pet. If you have concerns about the possible extraction of teeth, please feel free to discuss this with your veterinarian prior to the dental appointment. Please also remember that we require pre-anesthetic blood work to assess the overall health of your pet prior to anesthesia. We may also send antibiotics home before or after the dental procedure to prevent or treat infections.